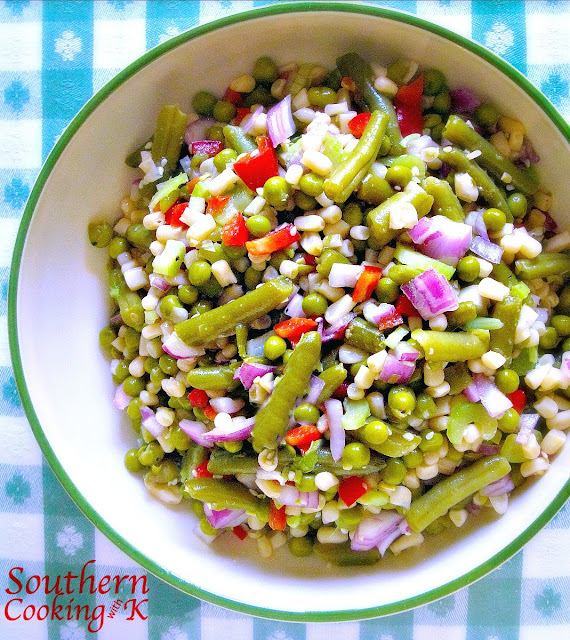 Marinated Salad, a retro vegetable salad that has stood the test of time sometimes called Shoepeg Corn Salad in the South. 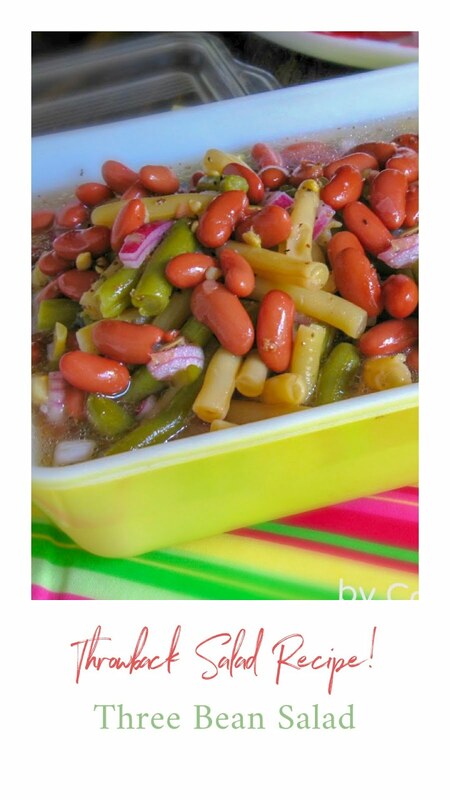 The recipe starts with traditional ingredients like green beans, green peas, and shoepeg corn. Add some crunch with chopped celery and red onions and red bell pepper. 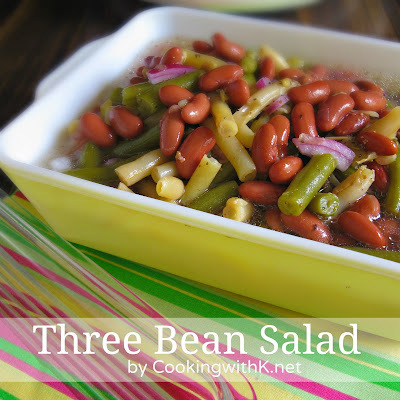 Toss all of it together with an oil and vinegar dressing. The dressing is this glorious balance of tangy and sweet made with sugar, vegetable oil, apple cider vinegar, and salt and pepper. After tossing it all together, refrigerate for at least a couple of hours. The salad is one that gets better and better the longer it marinades. 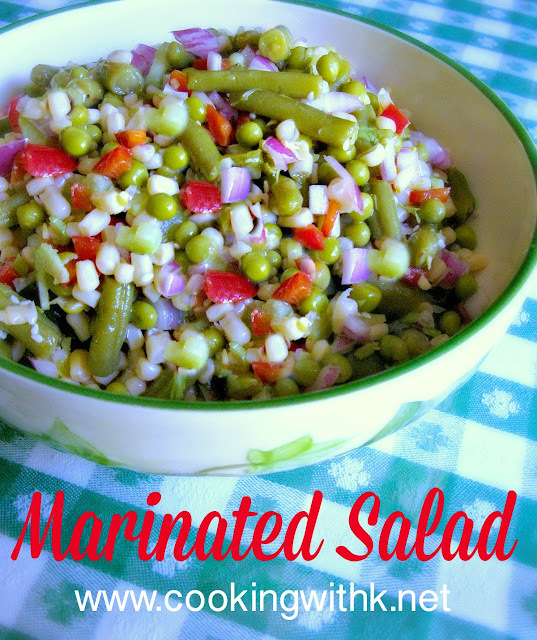 Marinated Salad is a perfect salad to take to potlucks, picnics, and gatherings that are long distances away. It holds up good traveling, and when you arrive, you just give it a toss, and you are ready to serve it. 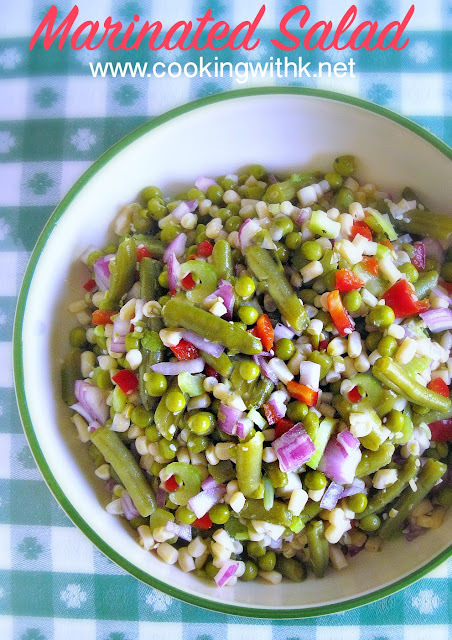 In a large bowl, mix corn, beans, peas, celery, red bell pepper, red onion; set aside. On medium heat, in a saucepan combine sugar, vegetable oil, coriander, salt, black pepper, and red pepper flakes. Bring to a slight boil and pour over vegetables; mix well to coat. 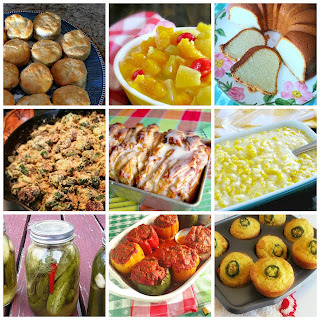 Refrigerate for at least 2 hours before serving, overnight is better. Cook's Note: I have substituted Truvia in place of sugar and it works well. 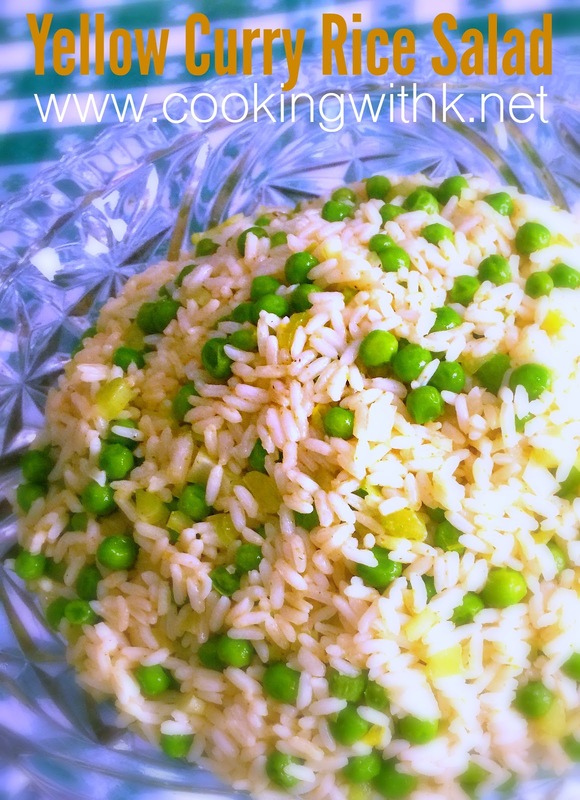 Such a great recipe - thanks for sharing!! 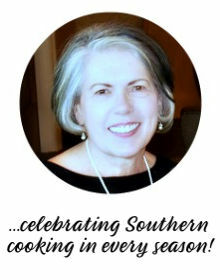 So happy you stopped by...welcome to CWK! ONLY CHANGE I MADE WAS TO USE 1/3 CUP CIDER VINEGAR AND 1/3 CUP TARRAGON VINEGAR. JUST LIKE THE OLE DAYS IN TASTE. VERY NICE.